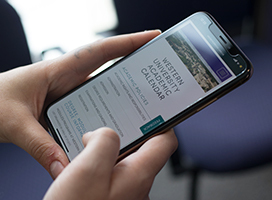 Western students who have been admitted to the University and are in good academic standing can select courses during course registration periods via the Student Center. Your appointment time (only for Fall/Winter registration) is your earliest date and time at which you can start course registration. You can continue registering while the online registration period is open, but it is recommended you utilize your scheduled appointment time for best course selection. Where do I see my Fall/Winter Registration Appointment? An email is sent to your Western email once your appointment time has been assigned. Go to Student Center and log in. Ensure that your cookies are enabled and any pop-up blocker is set to allow popups from student.uwo.ca. Go to the right side of the main page, and check the section entitled “Enrolment Dates”. The next page will list a date and time that you are allowed to start registering in courses online. Until this date/time is reached, you cannot register in courses online! Once your appointment day and time has been reached, you may begin enrolling in courses by going to the “Academics” section and clicking the “Enroll in Classes” link. This message is given when you attempt to enroll for a course incorrectly. This error occurs if you try and add a course in a career you are not registered in, if you try to add a course in a term you're not activated in, or if you try to add a course outside of the time period allotted for registration/adding courses. If you are having problems adding a course in a career you are in concurrently, you must ensure you're adding into the correct career. Note for Year 1 Students: Year 1 Students are not competing for the same courses as senior students, therefore, they may select courses at any time during the enrolment period starting June 17th. It is recommended that they receive Academic Counselling through the Summer Academic Orientation program. Adding and Dropping of courses takes place throughout the Academic Year. Various deadlines are set and are listed in the calendar portion of this site as well as in the Academic Calendar under sessional dates. Note: You are responsible for ensuring that your registration is accurate and complete. Ensure that you have satisfied the academic requirements for your program/module after you have completed any adds or drops. There are financial and transcript implications to dropping courses. For more information visit the Academic Calendar. During this phase, students must drop courses with the Department(s) using the form below. After you have dropped a course with the Department(s), you must submit your completed Course Change Form for approval to your Academic Counselling or Dean's office of your home Faculty. Drop locations are not available on Saturdays and Sundays or Statutory Holidays. You must be activated in the term in which you want to register in courses. For information on term activation see Summer Term Registration tab in Prepare to Register . Note: All newly admitted and visiting students are automatically term activated. Go through the Academic Calendar & Timetable tab in Prepare to Register to find information on the courses & sections you are interested in, as well as some alternates in case of conflicts/full courses. Use Draft My Schedule to help you build an individual conflict-free class schedule. This tool does not import your course selections into your Student Center but allows you to play and create your timetable in order to then go to Student Center and enroll your courses! Note: Ensure you have any prerequisites or co-requisites needed and that you do not have any anti-requisites. The Calendar course information contains course names, numbers, descriptions, and the necessary prerequisites/anti-requisites/co-requisites for the course. Log in to Student Center. You will need your Western User ID & password. If you do not have this information, use our Student Center Access Guide. If you have a valid enrollment appointment, you may begin adding, dropping or swapping classes. Under the Academic Section select Enroll in Classes. When the course you are searching for appears, select the Next button to go to the next step in registering for this course. This course has now been added to your Course Enrollment Worksheet. Note: At the bottom of the page you will see classes you have already placed in your shopping cart. You are NOT enrolled in these courses until you have completed the adding process. Repeat above steps to continue adding classes. Select the Finish Enrolling button to enroll in the class(es) in your Course Enrollment Worksheet. Select the course you wish to swap out by choosing from the list in the Select from your schedule dropdown box. Choose a course to replace it using either the Class Search or My Planner if you have courses saved in your planner. After making your choice, you will be presented with a page with the details on your swap. Review the details of your swap & once satisfied, click the Finish Swapping A page will come up with the information about your swap. The status heading will tell you if your courses were swapped successfully, or if there was an error. Note: If you are trying to swap just the tutorial or lab, please see the Swapping a Lab or Tutorial information below. From the dropdown, select the course for which you wish to swap the Tutorial/Lab/Exam Centre. Select Class Search from the Search for Class dropdown and click Search. Search for the SAME course you chose in the dropdown in step 3 then select Search. Select the Tutorial / Lab / Exam Centre you want to change to THEN select the same Lecture you are currently enrolled in. Select Next. Select the Finish Swapping button to complete the swap. When adding a class, if there is a yellow triangle symbol you will have the option to join the wait list. Note: Eligibility to enroll in a class may change during the course registration period. A wait list position does not guarantee that you will be enrolled when space is available in the class. A process will run daily during the course registration period to enroll students from the wait list. The next eligible student (ex: student in position #1) will be assessed and if all enrollment conditions are met, the student will be automatically enrolled into the class. Note: A delay between when a space becomes available in a class and when a student will be enrolled from the wait list may occur. A notification will be sent to your Western email account when you have been automatically enrolled into a class from a wait list. Check your personal class schedule regularly for wait list and enrollment changes. How Many Wait Lists Can I Join? How Do I Remove Myself From a Wait List? Simply drop the class as you would drop any other class during the course registration period. You are responsible for dropping the class if you no longer wish to be enrolled. I Was Not Enrolled From the Wait List. What Happened? Enrollment conditions must be met to be enrolled from a wait list. If all enrollment conditions are not met, you will remain on the wait list and will be re-assessed the next time space is available. Enrollment priority/restriction has not been met. You may join a wait list even if you do not meet the current priority/restriction condition. However, enrollment from a wait list can only occur if the priority/restriction condition is met or is no longer required. See Timetables of Scheduled Classes in Prepare to Register. Undergraduate Students in specific programs of study will have the option to designate a degree-credit course as a Discovery Credit effective for the 2018-2019 academic year. The Discovery Course credit option for undergraduate students encourages academic exploration without the fear of decreasing a student’s cumulative or graduating average and supports students in exploring course material outside of their area of study. When your course is approved, the Office of the Registrar will convert the submitted grade to pass/fail for those students who have opted for that grading by the end of the drop period without academic penalty. Students requesting the Discovery Credit option are expected to fully engage in the requested course of study. Completion of course requirements such as tests, examinations, group work, written submissions, etc. are required in order to be evaluated for a passing grade.